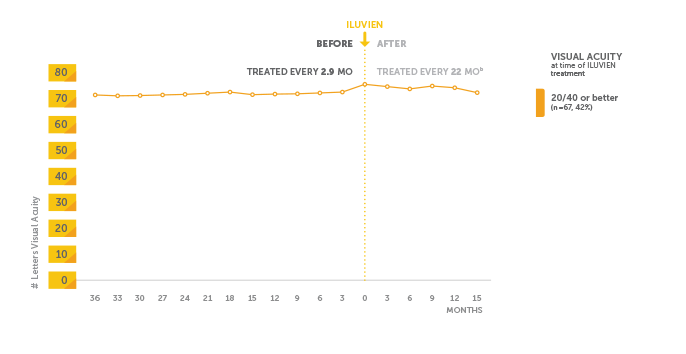 aMean follow-up after ILUVIEN across the total USER population (N = 160) was 403 days, with 102 eyes followed up for 6 months, 92 for 12 months, and 88 for 15 months. The number of patients available for follow-up at each time point varied. bP<0.001 vs treatment frequency before ILUVIEN. of ILUVIEN in a variety of patients with persistent DME. a patient with persistent DME and 20/40 VA. USER was a retrospective study of 160 eyes in 130 patients receiving ILUVIEN. Data on file. Alimera Sciences, Inc.